Tatarstan is an industrial region. Kazan, Nizhnekamsk, Naberezhnye Chelny and Almetyevsk are the industrial centers of the Republic. Almetyevsk district is certainly well known for its oil and gas industry. Its administrative center is the headquarters of the oil company PJSC "Tatneft". December 20, 2018 marked the strengthening of the industry by establishing new company on the Almetyevsk land. 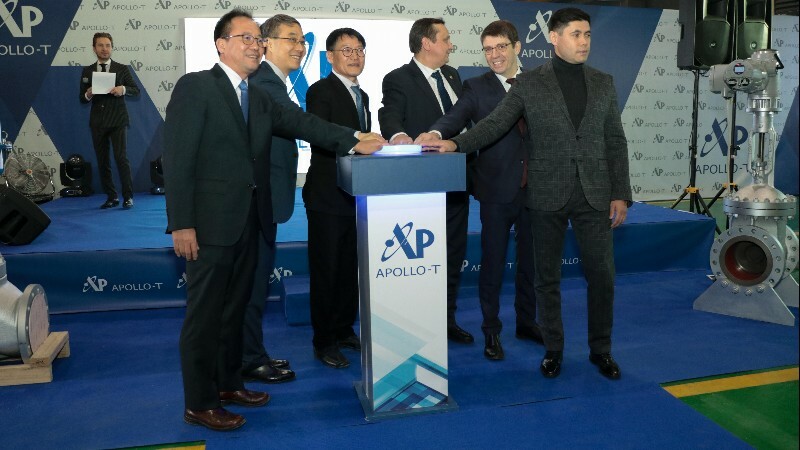 Thus, the solemn opening of the first stage of the plant for the production of valves of Apollo group of companies (Korea) took place. Apollo produces industrial equipment for oil refineries, petrochemical plants, power plants and other industries, cooperates with large companies around the world. The construction of the plant was carried out in the framework of the agreement with Tatarstan Investment Development Agency, as well as the List of instructions following the visit of the President of the Republic of Tatarstan Rustam Minnikhanov to the Republic of Korea. Thus, thanks to full support of the leadership of the republic, with the support of the Almetyevskiy municipal district, in October 2016, the work on establishment of joint enterprise started on the territory of the technopark "Tatneft-Active". "With the opening of the plant, we have made a big step in strengthening of the Korean-Tatarstani relations, expanded the geography of the countries from which investments are coming to Tatarstan. We are very glad that the first Korean company is now localized in Tatarstan. We wish the plant a lot of orders and qualitative work", - the head of Tatarstan Investment Development Agency Taliya Minullina noted. To date, the plant "Apollo-T" with the total area of 2 200 square meters is equipped with a line on manufacture of pneumatic actuators and assembling regulating and shut-off valves, test equipment. Production capacity of the plant allows to produce up to 7 000 units per year, but by 2021 the increase up to 15 000 units per year is planned. Already now, the consumers of the plant are the main petrochemical and oil-refining enterprises of the Republic of Tatarstan and Russia. The opening ceremony of the plant was attended by the Minister Plenipotentiary of Economic Affairs of the Embassy of the Republic of Korea to the Russian Federation Kang De Su, the President of the Apollo group of companies Kwon Te Geun, Director General of "KOTRA" in the regions of Russia and CIS countries Kim John Ken, representatives of "Tatneft" group of companies. Kang De Su mentioned that the interest of Korean companies in the development of relations with Tatarstan is growing, and expressed hope that the development of the production in Almetyevsk will contribute to strengthening of the city's economy and the whole region. The total planned amount of investment in Tatarstan in this project is $ 50 million. The service department operates 24 hours a day, 365 days a year. In addition to the service support system, basic valve performance tests will be conducted, including hydraulic testing and valve maintenance for all the nearby refineries and petrochemical plants. The Head of the Executive Committee of Almetyevsk municipal district Marat Girfanov congratulated the participants of the event on the historical event on behalf of the Head of the district. He emphasized that due to the opening of a modern high-tech plant, new jobs have been created. The culmination point was the launch of the trigger mechanism by the guests of honor, which gave a solemn start to the work of the plant. Then there was the study-tour around the site and introduction of the production technology. Kwon Te Geun indicated that the plant's activities are environmentally safe, and the production is planned to be expanded. Moreover, it is expected that the work for major repairs of the equipment and urgent maintenance services held on the plant will contribute to the growth of demand for products. At the moment, about 20 people are involved in the production process, it is planned to increase this number to 100 or more.